Chopper - expected this week. This is an analogue switch on steroids. 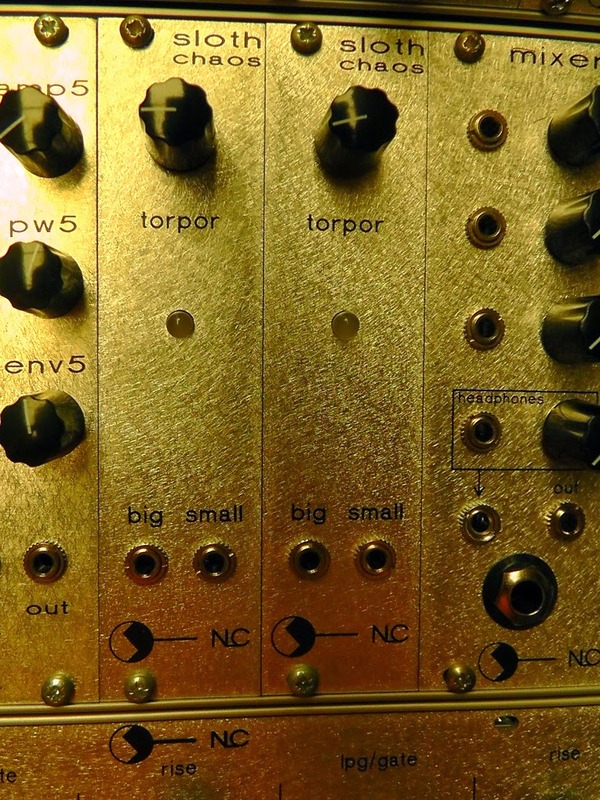 The concept came from a 60s chopper modulator circuit. 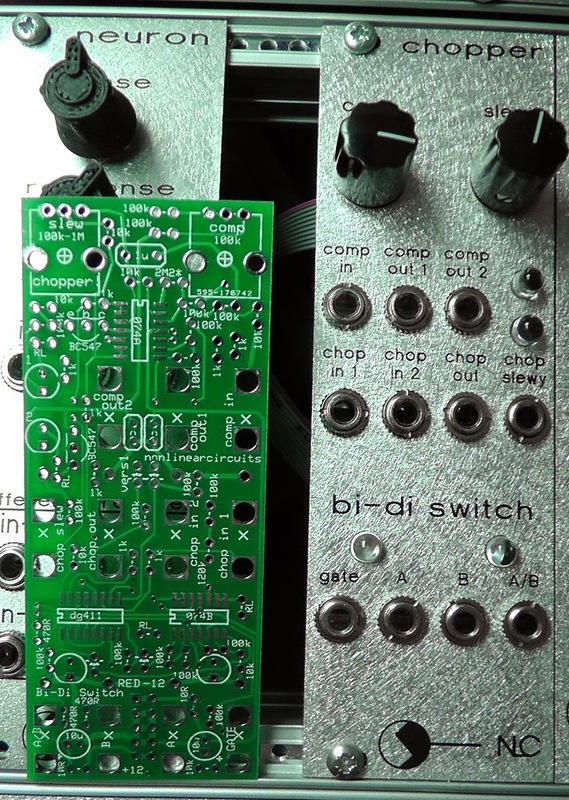 It can be used as a VCO, a VCF, a waveshaper, ring modulator, analogue switch, LFO and VC gate generator....probably more. It can switch between two input signals with the actual input signals deciding when to switch, or the change can be VC or manually controlled. 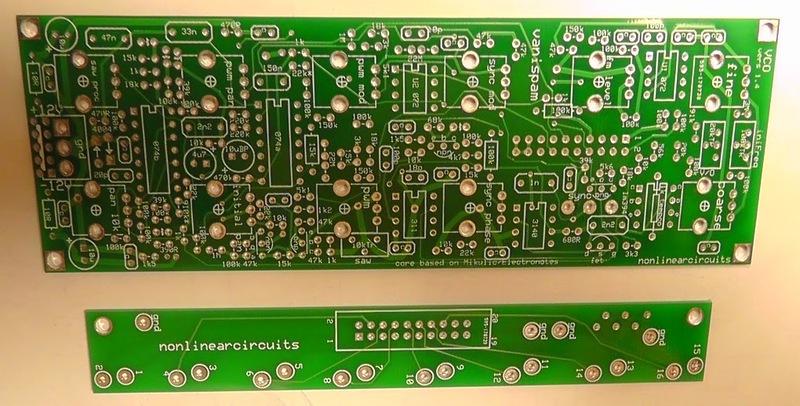 There is also a bi-directional switch as a separate circuit on the same PCB. this is functionally the same as the early Serge bi-di Router but uses a DG411 analogue switch rather than a 4007 to do the work. FF Chaos (flip-flop) - This is another chaos module but designed to supply a variety of gates and triggers. It is self running but can be synced with the gate/trigger input. There is also a CV input which shifts the output between periodic and chaotic behaviour. There are two CV outputs, one trigger output and three gate outputs which supply different and varying gates that can be delivered in bursts......this thing is simply nuts. 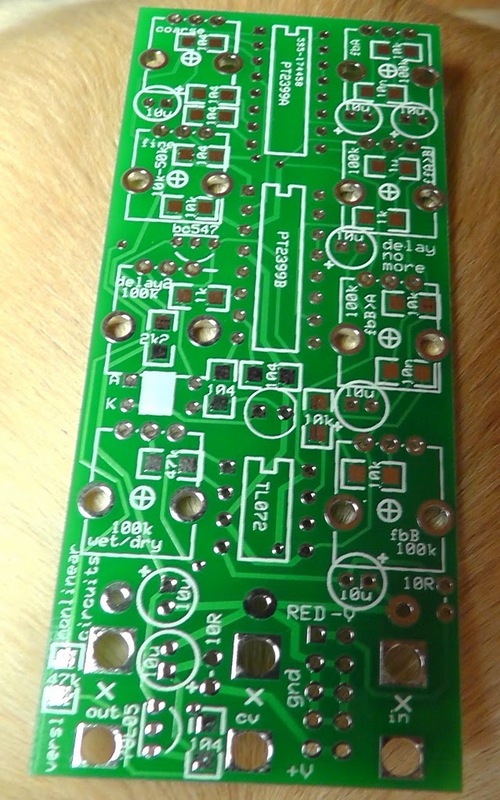 The most common build error with these is people soldering the passives on the bottom of the PCB onto the wrong pads. Please use the above picture to check the passives are installed correctly. 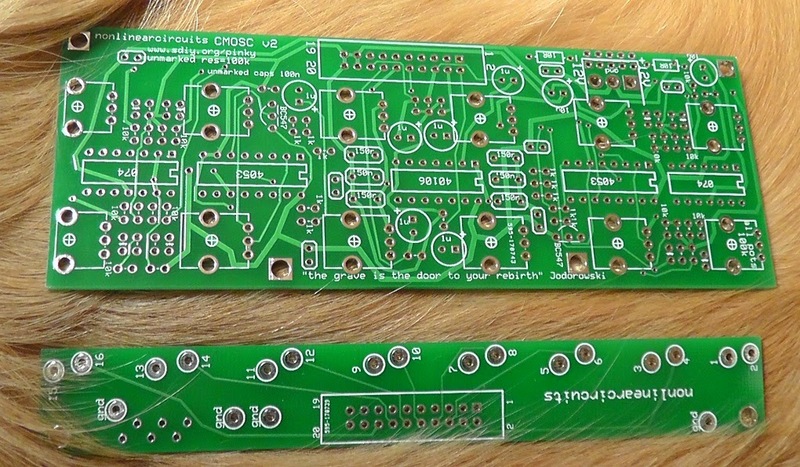 Also some PCB versions need a couple of mods, check the Build Guide to see if your version need these. This is a 3 input mixer with a minijack and 1/4" output as well. The headphone amp has its own input and volume control. This way you can monitor a single patch and set it up whilst other patches are fed to the PA. If nothing is inserted into the headphone input, then the mixer output is routed to the headphones, so you can patch away in bed without disturbing your sweet sleeping partner. All the pots and minijacks are mounted on the PCB. The 1st batch of these are reserved for the WAMOD workshop, a 2nd batch will ba available in late October.